The Brief: Established in 2017, Habis is a restaurant, cafe and bar with a unique Spanish twist that is highly recommended on Trip Advisor and Facebook. 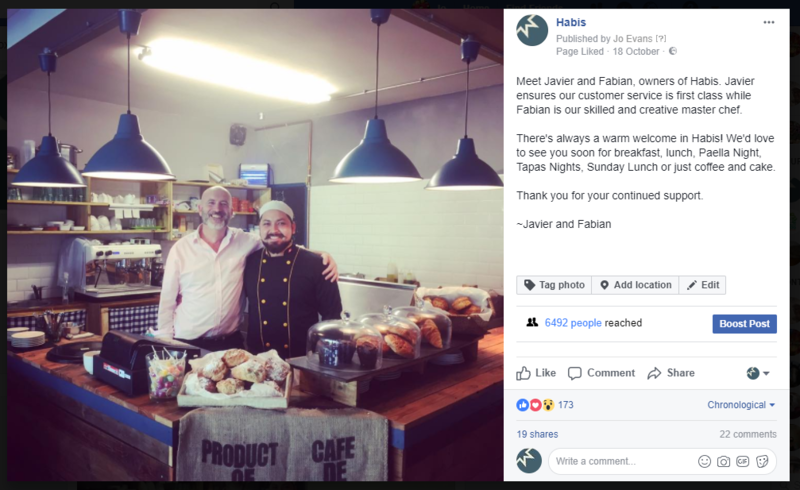 Owners, Javier and Fabian, approached Emerald Frog Marketing to promote Habis across the local area through social media management and brand awareness campaigns. They wanted to increase the number of daytime visitors to the cafe and also create suitable messaging around their evening restaurant to publicise Paella and Tapas Nights. The Results: Habis has experienced a huge upturn in social media followers and engagement across not only the local community but further afield, with customers from Cambridge and Huntingdon now making the journey to Littleport to see what all the fuss is about! Through analysing customer demographics and tailoring the messaging and marketing opportunities accordingly, Habis are now engaging with the wider Cambridgeshire community and will be taking part in next year’s Food Festival to further raise their profile across the area. Emerald Frog Marketing Limited is a company registered in England and Wales with company number 07558374.